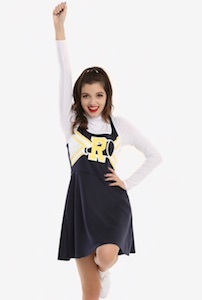 If you want to be part of the River Vixens then you just need to get this Riverdale cheerleader uniform. The women’s dress is just what the River Vixens wear in the Riverdale TV series so you can choose to wear this dress around town any day of the year or just as part of a cosplay or Halloween costume. The Riverdale dress comes in women’s junior sizes XSmall – 3XL and it is made from 95% polyester and 5% spandex. Now you just have to start trying your cheers and get a white long sleeve shirt for under the dress and you are ready for Riverdale.